Take lemons and make…something with lemons in it. Throughout the eons, lemons have been used for a multitude of nonculinary purposes—as an epilepsy remedy, a toothpaste, an invisible ink and a bleaching agent as well as in witchcraft. Though it originated in Southeast Asia, the lemon is now cultivated in tropical and temperate climates around the world, with California leading production in the United States. This bright yellow citrus fruit is oval in shape, with a pronounced bulge on the blossom end. The flesh is juicy and acidic. The lemon can range in size from that of a large egg to that of a small grapefruit. Some have thin skins while others have very thick rinds, which are used to make candied lemon peel. 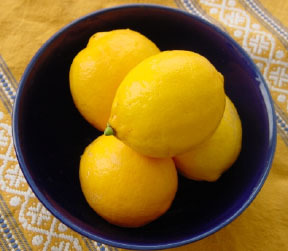 Lemons are available year-round with a peak during the summer months. Choose fruit with smooth, brightly colored skin with no tinge of green (which signals underripeness). Lemons should be firm, plump and heavy for their size. Depending on their condition when purchased, they can be refrigerated in a plastic bag for 2 to 3 weeks. The lemon has a multitude of culinary uses for dishes sweet to savory, as well as a flavoring in many drinks. Few foods add such flavor magic as the simple lemon. Bottled and frozen lemon juice are also available in most supermarkets. The frozen juice is a passable substitute but the bottled product bears little resemblance to the real thing. Though the lemon is an excellent source of vitamin C (one provides 40 to 70 percent of the minimum daily requirement), it begins to lose its vitamin power soon after it’s squeezed. There’s a 20 percent loss of vitamin C after only 8 hours at room temperature or 24 hours in the refrigerator. Both lemons and limes are regularly served as lemonade or limeade, its equivalent, or as a garnish for drinks such as iced tea or a soft drink, with a slice either inside or on the rim of the glass. A wedge of lemon is also often used to add flavor to water. The average lemon contains approximately 3 tablespoons of juice. Lemons brought to room temperature before squeezing increases the amount of juice that can be extracted. (You can also roll a lemon with your palm along a hard surface to get the juices flowing.) Storing lemons at room temperature for long periods makes them more vulnerable to mold. Lemon juice is typically squeezed onto fish dishes; the acidic juice neutralizes the taste of amines in fish by converting them to nonvolatile ammonium salts. In addition, lemon juice is widely used, along with other ingredients, when marinating meat before cooking: the acid provided by the juice partially hydrolyzes the tough collagen fibers in the meat (tenderizing the meat), though the juice does not have any antibiotic effects. Some people like to eat lemons as fruit; however, water should be consumed afterwards to wash the citric acid and sugar from the teeth, which might otherwise promote tooth decay and many other dental diseases. It can be used on its own or with oranges to make marmalade. In a small saucepan over very low heat, heat the sugar and 1 cup of water until the sugar is dissolved completely, stirring constantly. While the sugar is dissolving, use a juicer to extract the juice from the lemons. Add the juice and the sugar water to a pitcher. Add the remaining 4 cups of cold water (more or less for the desired strength). Refrigerate 30 to 40 minutes. Serve with ice and sliced lemons. This entry was posted in Fresh Pick, lemon, recipe. Bookmark the permalink.